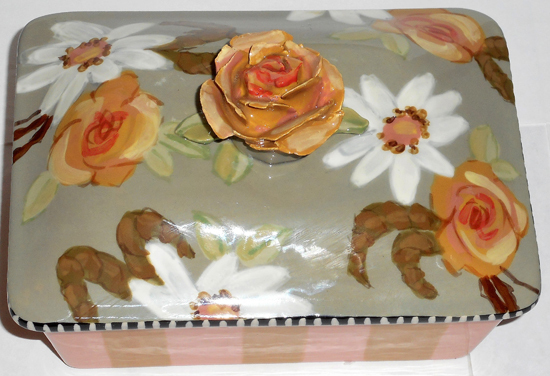 Rose Knob-ed Jewelry Box- 4"tall x 4 3/4" wide x 6 1/2" long. Beautiful hand carved Rose Knob and felt lined box to hold your keepsakes. We can also paint anyone of our many patterns on this shape for you. Just call (508)932-2574 and we'll be glad to assist you. Click on photo to enlarge for details. 4-6 weeks delivery.